SPECTROX BLOG: SPOT my location, please. Recently I was looking at Electronics at REI. 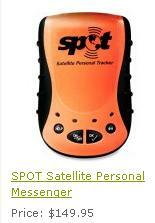 I ran across this personal locator beacon, that was fairly inexpensive, called the SPOT Satellite Personal Messenger. This little box has a GPS receiver and a satellite transmitter all in a ruggedized and simple case. If you are in danger, you can press the 911 distress buttons and it alerts their emergency operations center. But the cool feature is that it can be used to "check-in" with your location, which gets forwarded to your designated SMS and e-mail recipients. I would love to see an SMS or e-mail to APRS-IS gateway that for a device like this. Could you imagine the search and rescue implications for hurt hiker or boater to give their exact coordinates to the SAR staff this is trying to rescue them. Heck, this might even be a wonderful tool for people that are outside of normal phone service range that just need a reliable way to signal their need for help. It isn't complex, nor can it send complex messages, but a location and a distress signal is worth every penny you pay for it when you really need it.